From William Henry, Spearpoint ‘Estacada’ a light and resilient frame in aerospace grade titanium, inlaid with a beautiful piece of stabilized Blue Spruce pinecone. 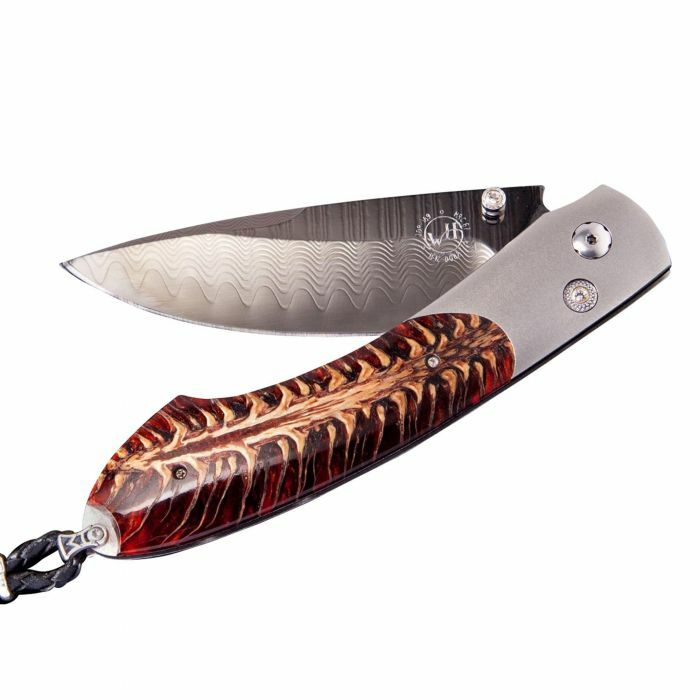 The blade is in William Henry's signature black-coated 'Wave' Damascus steel with an extra sharp core in ZDP-189 steel; the one-hand button lock and the thumb stud are set with white topaz gem stones. A remarkable design that gives you an instrument with a full-size secure grip, and a versatile deep-belly blade, the Spearpoint epitomizes William Henry’s core philosophy – that superlative function deserves to be elevated to superlative art. The ‘Estacada’ features some of the most exotic materials, and forged metals that are the hallmark of William Henry's collections; a timeless heirloom to be proudly worn and used for a lifetime.